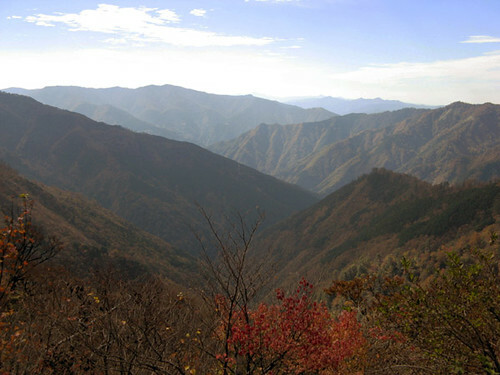 A traverse of the Kyushu Backbone Range. Yellow track is hiking (N to S, 66km, 3 days, 31 hours hiking time), and red track is the bike ride required to spot the car (S to N, 67km, 4 hours). Access was via Ichinose, Gokase Town, Miyazaki Prefecture, from the northeast, and the car was spotted at Yatate campground, Shiiba Village, Miyazaki Prefecture. This fall we finally did a hike we had wanted to do ever since we moved here – a long traverse of the so-called Kyushu Backbone Ridge. 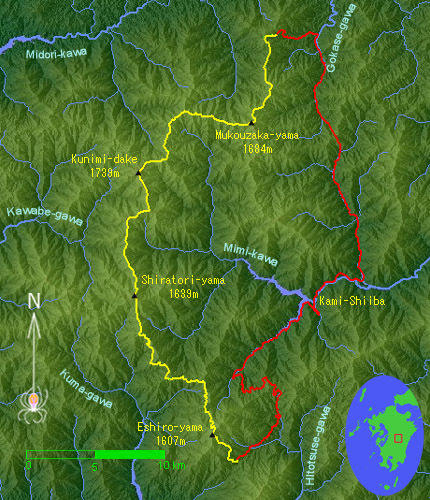 Located in the dead center of Kyushu, the backbone ridge forms the border between Kumamoto and Miyazaki Prefectures. In general, the ridges linking the summits here are relentlessly high, offering few chances for roads to cross them and civilization to creep in; indeed this area is one of the remotest in all of Japan. Although, as we are painfully discovering with every trip here, this mountainous region has recently experienced severe environmental damage despite or perhaps because of its remoteness, the very ridge tops at least have been left alone and natural forests thrive there. To be surrounded by such untouched scenery for as long as possible was the main motivation for this hike. Dawn on day two was frosty and clear, and wintery colors persisted till late morning. The hike requires a minimum of three days for all but super-humans, and so we jumped on it as we chanced upon a rare three-day weekend at work, even though the third day’s forecast promised solid rain. The trip began with Leanne schlepping the heavy bag up the initial hill while Rick went to spot the car. Either was not a trivial task. Rick spent and hour and a half driving the twisty one-lane mountain roads that pass for national highways in these parts, then returned the same way by bike in four hours. By the time he was back at the trailhead, it was well into the afternoon on that late fall day, and his legs felt like lead. Radio contact was established with Leanne, who in the meanwhile had made good progress along the ridge. And so Rick, donning the lighter pack, endeavored to close the gap as best he could. As night fell, however, two mountains still separated the dynamic duo. Due to an oversight, Leanne brought no headlamp and so was obliged to wait for the two hours it took Rick to catch up. He was sufficiently wasted on arrival that packs were not exchanged, and we hiked together on a single lamp to Shiiya Pass, where we could finally pitch camp and get water to make dinner. 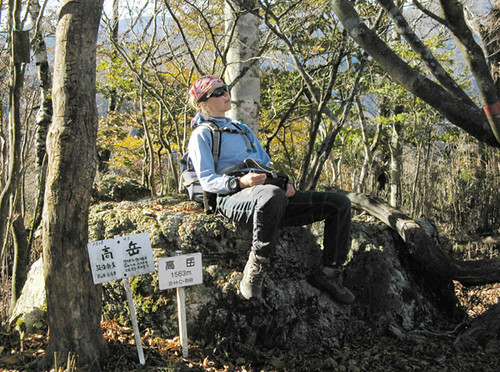 Leanne takes a brief break on the summit of Takadake, 1565m, one of numerous summits encountered on the high ridge. Day two went by uneventfully as we plodded on, enjoying the scenery, the sunshine, and what was left of the fall colors. Things got a bit interesting after nightfall which came just as the trail became difficult to follow: in the open woods there were only occasional blazes for reference, and any traces of faint trail were covered by freshly fallen leaves. Slowly and patiently we worked our way down this infrequently traveled section. Finally, no more trail was to be found on the ridge and we descended onto a rickety forest road, whereupon finding water, we camped for the second time. Mount Unzen was visible from near Kunimidake. Though over 70km distant, it looked clear and close, much as it normally appears from our balcony door when we poke out our sleepy heads in our morningly ritual to check the weather. A dormant volcano whose most recent eruption in 1991 killed some people and built a whole new summit, distinguishable by its sandy color 15 years later even from this distance. This mountain is often incorrectly referred to as Fugen-dake by the natives, that being the name of the previous high point from whose slopes the violent eruption began, but which today is dwarfed and all but covered by the new summit. The technically correct name for the summit is in fact Heisei-Shinzan, but we prefer Unzen, which is the collective name for the whole massif, and translates as Cloud Hermit. 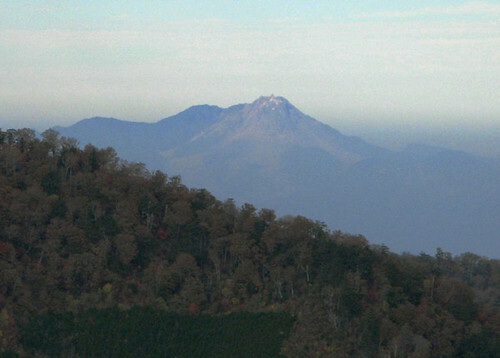 Kunimidake, the range's highest summit, has all but shed its fall colors. Soon a snowy, frosty winter will prevail here, while the civilized lowlands below may not see snow at all. The high ridge we hiked represents a remnant of a plateau, so the individual summit slopes are long but gentle. Nevertheless the going can be slow due to the rough trail, fallen trees and branches, not to mention navigational difficulties, so in the end we only averaged just over two kilometers per hour. The patches of old growth forest intentionally preserved on the ridgetops are the true treasure of these hills. 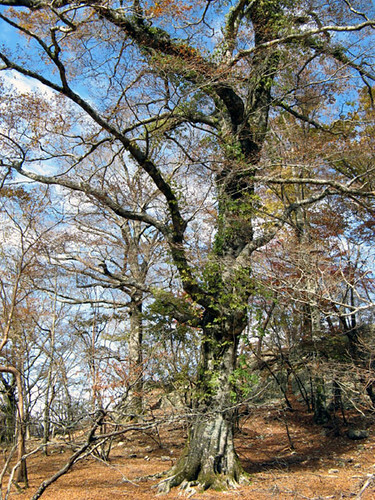 Perhaps due to scarcity of rainfall, the forest is usually open like this, with occasional large trees, of which the asian beech is predominant. Or perhaps it's due to the uncontrolled deer population; indeed grazing damage is visible everywhere, and deer can be seen around nearly every bend of the trail. The early afternoon sun brings back autumn color and warmth. 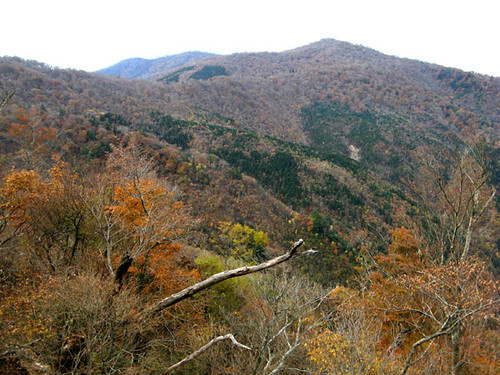 Ridge upon overlapping ridge forms this patch of land, Kyushu's remotest. Morning dawned overcast as expected. We followed roads for a ways, and although it was easy walking, the distance was long due to all their twists and turns. It began to rain about 9am; a cold, autumn rain that started as a drizzle but gradually intensified as the morning wore on. While on the roads, our Goretex coats kept us reasonably dry, but soon we had to push our way into the bush and in no time at all we were completely soaked. No official trails exist on this section but as luck would have it, a narrow swath of vegetation had been cleared along the prefectural boundary for a survey or something, so the going was not all that difficult and we started enjoying ourselves with this bit of orienteering adventure. 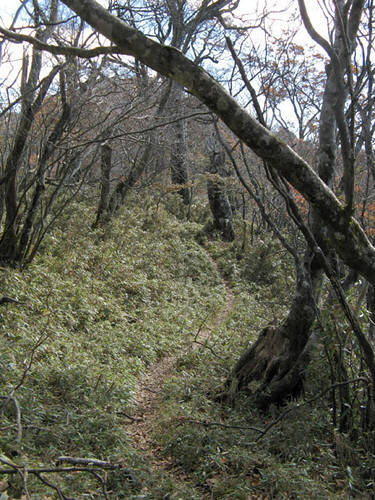 On the slopes of the final mountain, Eshiro-yama, we re-connected with roads again for the climb and descended the final hill on a well-established trail. Perhaps due to its more isolated nature and southerly position, Eshiro seems to get more rainfall than the rest of the range, and the vegetation here reflected this. While in the north, the forest is open, with huge, old, widely separated trees, and the undergrowth mostly a dusty bamboo grass, here a moist deciduous forest grows thickly and brooks trickle down among mossy rocks. The path and the forest floor was all colors from the freshly fallen leaves, while the trees still retained a part of their colorful mantles; it was a scene of great beauty not to be unappreciated even in our exhausted, cold state. A hiking path such as this wound most of the way along the ridge, though there were some blazes-only sections as well as some pure bushwhacking. We chose some paralleling forest maintenance roads to bypass a long, lower, and trail-less section of the ridge near the south end of the course, though the purist might have preferred the low-grade bushwhacking reportedly found on the crest. Not too surprisingly, our feet had suffered the most on this outing, and would be numb for several days. But an excellent natural hot spring in nearby Yuyama awaited us near the hike’s terminus; there our body temperatures were restored to normal. After soaking for an hour, we drove back through the mountains to recover the bike. Then, finally out of the hills, we even made our favorite Indian restaurant before closing time; though he hasn’t asked yet, the young owner must be wondering about the recent appearances of dirty gaijins late at night who quickly deal with his considerable portions of spicy curry and 40cm-long nan bread. Thus fully satiated mentally and physically, we drove the remainder of the way back to Amakusa. A chart of the two-day Amakusa circuit. 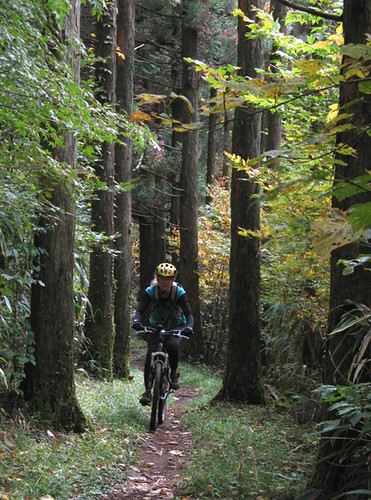 The tour began and ended in Tomioka near Amakusa's north-west extremity, and we got a few hours' rest at Goshoura. 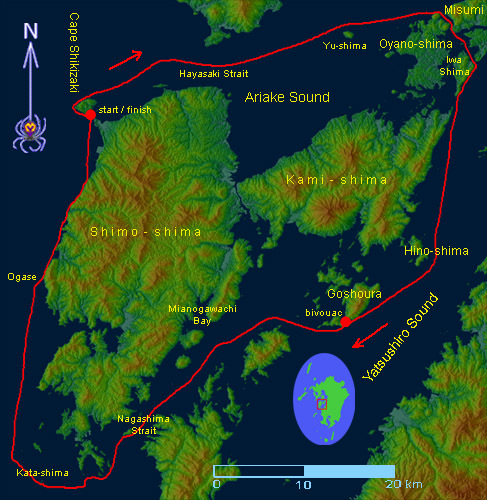 Other than that, landfall was made only in the Misumi Strait and very briefly at Katashima. The total distance for this trip was 179km, paddling time 28 hours. A few weeks later, the full moon had come, bringing with it the spring tide. With reasonably calm weather forecasted, we set out on a 2-day tour of Amakusa, along the same course as Rick’s 24-hour circumnavigation last March. This time it was Leanne’s challenge as well. The 2-day version actually uses the tidal currents more effectively, and so it is naturally more pleasing: there is no feeling of fighting or racing to meet the tide. 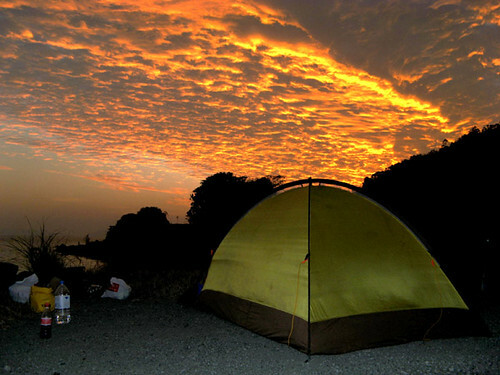 In terms of difficulty, it is only somewhat less demanding than the 24 hour version: while a lower average speed, the possibility of one or two brief stops, as well as a hot dinner and a few hour’s sleep take the edge off a bit, two nights in a row of virtual sleep deprivation and the four additional hours spent paddling also do take their toll. In the Misumi Strait at sunrise, day one. Leanne grabbed a few hours’ shuteye after work on Saturday while Rick sorted out the logistical details, and by 2am Sunday morning, we were already on the water off Cape Shikizaki. We enjoyed a following current as we traversed the Ariake Sound through the night, with the full moon overhead lighting our way. As expected we met with a light to moderate headwind but it did not seem to slow us down much. At sunrise we traversed the Misumi Strait, where the current had just turned in our favor. A brief stop at Shirase, a sand bar in the middle of Misumi Harbor, served for a stretch of the legs and bodily relief in the early morning sunshine. Then we began the second half of the day’s leg, down the Yatsushiro Sound, passing Iwa, Kami, and Hino Islands, and finally stopping at an abandoned quarry on Goshoura Island for a respite, and to wait for the turn of the tide. Our timing was perfect thus far: we had matched the tides and were also able to use the last couple of hours of sun to dry our wet clothes. After a big spaghetti dinner and preparations for the next day, we crawled into the tent for all of 3½ hours of sleep, this being pre-determined by the tide. Sunset colors bid us good night at Goshoura-shima. At 8:30pm still on Sunday, we jumped out of our sleeping bags feeling like a million bucks – whether that was due to our excitement or the ibuprofen we took before bed to ease our pains, we could not be sure. We donned our very foul-smelling, but dry clothes and soon we were on our way again. 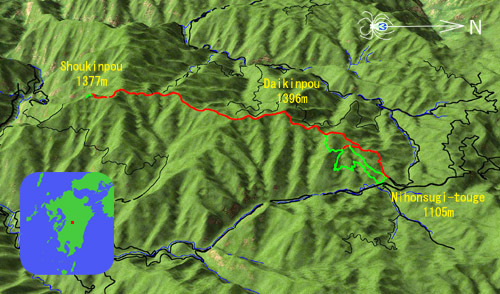 A large drop in the tide provided propulsion for a speedy traverse of the Gannoshiri, Hachiman, and Nagashima Straits. Besides the mouth of Miyanogawachi Bay, a great mountain gate where cold air pouring out from the interior of Shimo Island often creates wind and waves, it was dead calm and quiet, with not even fishing boats to be seen. The waters moved smoothly, quietly, and deceptively quickly through the straits, carrying us with them. 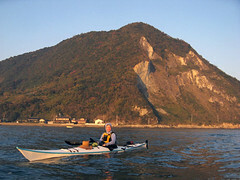 It was still dark as we paddled onto the open seas around Amakusa’s southernmost reaches. We were now under our own power and expecting a headwind again, which did occur, especially where funneled onto the sea by the island’s topography. Sunrise was welcomed but like the day before, brought with it the paradox of intense sleepiness. During the next two hours, Rick estimates he spent half his time asleep, having conditioned himself to balance and paddle in that state. Only one emergency brace was needed to prevent capsize, and it was a surprise how quick and accurate one’s reflexes can be a split second after snapping awake. But perhaps it would have been better to tip into the cool water to chase away the drowsiness! After the landmark Kogase and Oogase rocks teeming with the usual sport fishermen, we could finally hug the coast to relieve the monotony of paddling out in the open, and although we were slowed somewhat by the unavoidable countercurrent, we finished the last leg of the trip in good spirits. 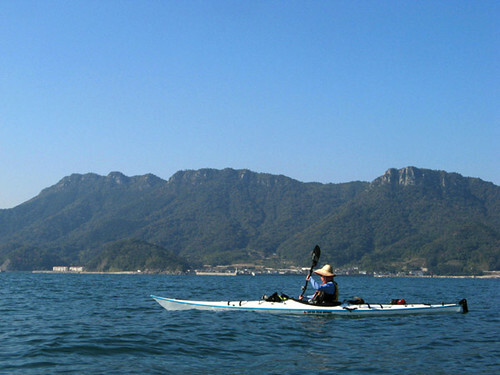 Paddling past Shiratake and Tsuwatake mountains, part of the "Kankai Alps" on Kami-shima. 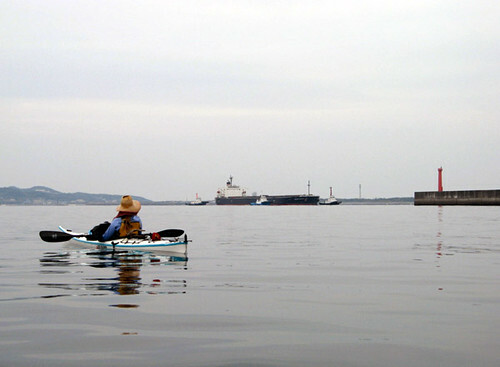 Within sight of our goal, we were obliged to stop just outside the Reihoku power plant and yield to a massive Australian coal ship being guided into berth by three tugs. The repetitive motions of paddling are so low-impact that it seems possible to push one’s muscles to nearly complete destruction without serious injury, as we found out while washing and packing our gear. The cumulative damage to Rick’s body seemed hardly different from the 24-hour circumnavigation. There were now two of us, but it was still difficult to lift the boats onto the car. To ward off sleep on the drive home, we chewed large quantities of “Xylitol” gum, which has enough menthol to blow the top of one’s skull off. Smelling no different than livestock by now, we deemed a hot bath necessary before retiring for a 15-hour sleep complete with crazy dreams. 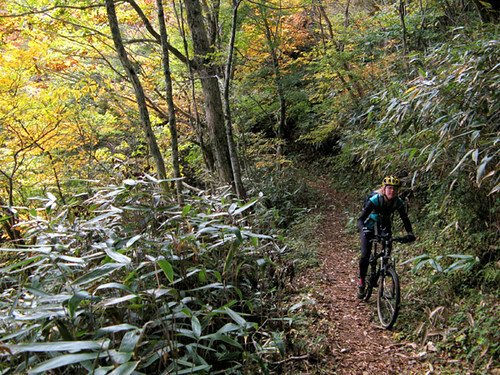 At the end of October, we made a one-day foray into the Kyushu Central Mountains once more. The fall colors were at their height, with typical settled fall weather: a light northwest breeze and a comfortable temperature. Overview of the excursion. Red trails were run by bike (at least one way) and green trails were walked (mostly an exploration of various logging and forestry-related trails). 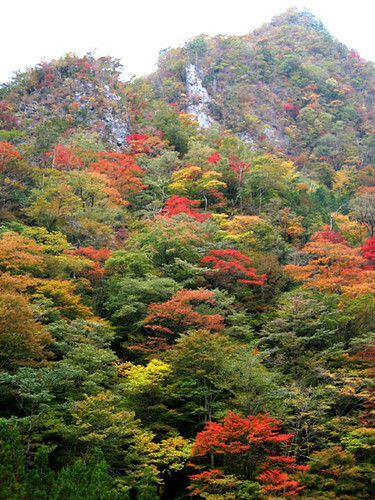 Nihonsugi-touge is a high pass taken by the (mostly one-lane) national hwy 445; from here it is only 200 vertical meters to reach the level 5km, nearly level section of the ridge. Our goal was a survey of a long, nearly level ridge linking two peaks: Daikinpou and Shoukinpou – the Big and Little Golden Peaks. This is one of the easiest hikes in the Central Mountains, owing to its very modest elevation gain – that due to the topography of the hills’ northern section. The high plateau from which this landscape was hewn by erosion must have been originally slightly inclined to the south, because its north extremity now forms a solid barrier: an enormous steep slope rising about a kilometer in height from the Midori River to the surprisingly flat northern summits. The several roads that climb this barrier cross it at a few ill defined passes after lengthy, sinuous climbs, but no river has broken through. A little to the south the topography changes abruptly from the steeps into a rolling highland; however, the streams that begin their invariably southerly flows from here soon form deep, dissected valleys many kilometers long. The Golden Peak ridge forms a rib between two such valleys, its northern end more or less blending into the highland, its southern terminus precipitous. Thus the trail from the north hardly rises to gain the ridge, then continues nearly level for a total of 5.8km. 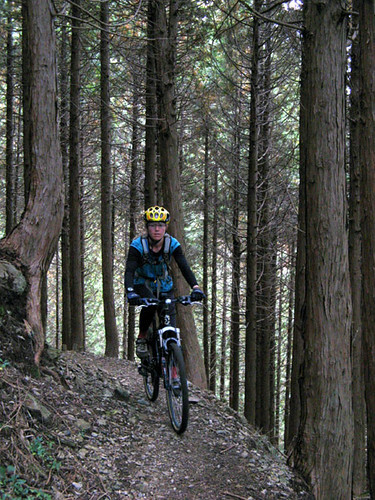 Anticipating this, we chose the mountain bike as possibly the easiest way to explore this trail. One of numerous delightful sections of the trail; bamboo-grass forms the undergrowth in the deciduous woods. We made a good choice: after heaving the bikes up the initial hill, we were able to ride at least 80% of the rest of the trail, including the final descent of the initial hill. 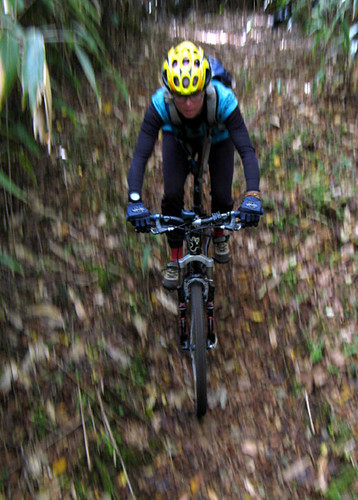 The trail was varied and interesting, as if made for mountain biking. It weaved in and out of natural and planted forests, and the summits themselves were accessed by short spur trails. Here and there a view opened up onto the mountainous landscapes surrounding us. In all we enjoyed a fun morning of exploring. Although comparatively level, the trail often traversed steep slopes and good balance and skill with a modicum of cojones was required to avoid a headlong topple downhill. This section is in planted forest with a noticeable lack of undergrowth. 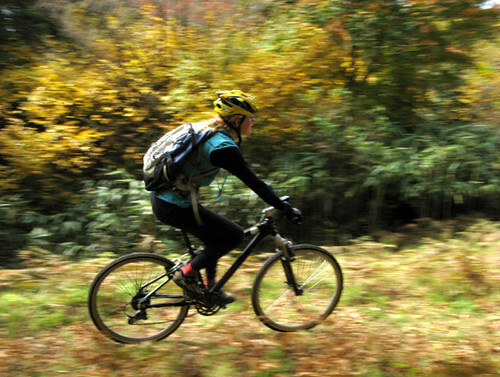 Careening down a hill, the world is a blur. Rather atypically, neither of us took a single spill on this trip. This planted forest had been adequately thinned and a healthy undergrowth is fluorishing under healthy and sizeable cryptomeria trees.